This recipe is about a month late in getting posted, not because I’m a completely lazy person but because I’m often going in so many directions at once that sometimes it’s easier just not to go in ANY direction when offered a few free minutes a day where directions aren’t required. Sorry about that. So, once we get past that, we get on to a recipe that worked. Oh my, did it work. 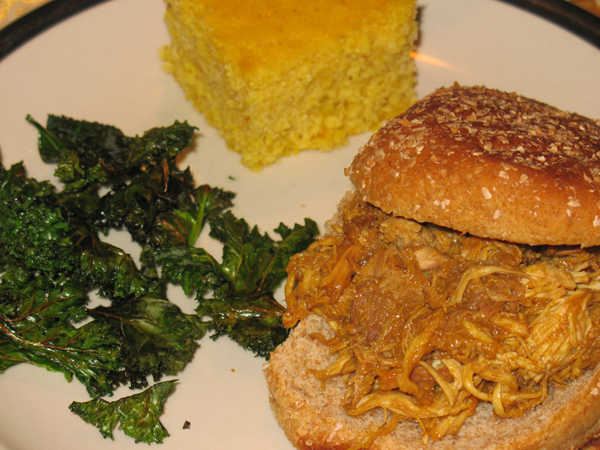 One of my favorite southern treats is a pulled meat sandwich (typically chicken, but pork is a close second), and when we were having family over for dinner it seemed like a simple way to prepare an easy crowd-pleaser. At my sister’s suggestion, I paired this with a maple cornbread recipe from the geniuses at King Arthur Flour – it’s a simple and tasty homemade cornbread that I will surely make again in the future. I also threw together a batch of kale chips, so there would be something green on the plate. OK, sure, the right accompaniment would’ve been either collards or fried okra, but kale chips seemed to be more my required level of effort. It also had the bonus of having been the first time my parents had them, so I had the rare pleasure of introducing them to something! The first picture shows you the full plate; the second picture shows you what happened when we thought it would be fun to try some of the pulled chicken on the cornbread. 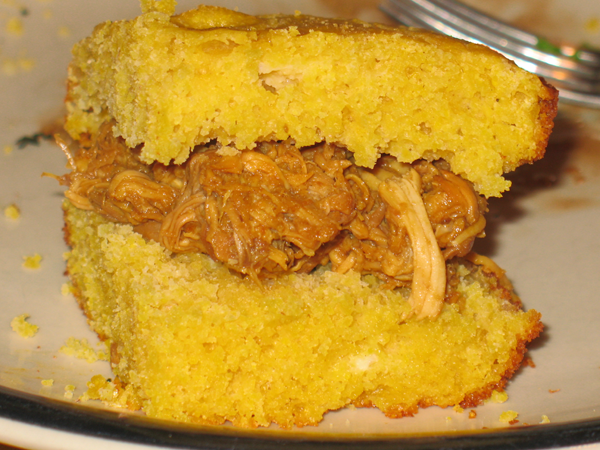 “I just want a small taste of the chicken…what would happen if I put it on a square of cornbread?” My BIL and I both thought of this at the same time, and his positive response to bite #1 of the combination spurred me to try it myself. OH BABY WAS IT GOOD. 1. Spray the inside of a 4qt round crock pot with non-stick cooking spray. 2. Add the chicken thighs and chicken breasts to the crock. Mix the worcestershire sauce, chili sauce, chicken broth and apple juice in a bowl and pour over the chicken. 3. Cover and cook on LOW for 8-10 hrs. 4. In a bowl, combine the ketchup, molasses, yellow mustard, and the worcestershire and green chili sauces that comprise the finishing sauce. 5. When the chicken is done cooking, remove it from the crock to a cutting board and shred with a pair of forks. 6. Dump out the liquid in the crock and put the shredded chicken back into the crock, along with the finishing sauce. Stir well to combine. This entry was posted in crock pot cooking and tagged chicken, cooking, crock pot, crockpot by crunchymetromom. Bookmark the permalink. I’m gonna need that drool bucket….